I’ve been in SEO for a long time and seen a lot over the years. Panda rolled out about a year into my career, then Penguin, then all the other amazing algorithm changes we’ve learned to roll with over the years. As Marshall Simmonds of Define Media Group says, “That right there is job security”. I’ve also seen Google slap down different tactics that seem to be gaming their algorithm unfairly. We’ve seen them allow and then drop emojis, remove and add stars to results, and so much more. Today I noticed something interesting happening that I haven’t seen in a while – a site getting star results off the back of another site’s reviews. Before I go any further, allow me to say two things. First, I have no vested interest in either of the companies I am talking about here. I simply noticed something happening. 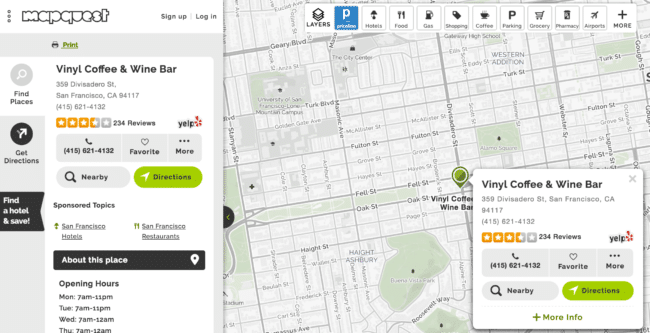 I also am not saying that MapQuest is doing anything wrong here. Google is notoriously terrible at figuring out the original owner of content. Today I was searching for some local results as I was helping a local business with their SEO. I noticed that MapQuest is getting star results showing in the search results even though they are simply displaying Yelp review counts. Let’s use Vinyl Coffee & Wine Bar in San Francisco as an example. Vinyl was my coffee shop when I lived in San Francisco. Nothing out of sorts there. Yelp has reviews and gets stars. Facebook has reviews and gets stars. Google has reviews and gives themselves prime placement. They have stars as well, with an aggregate rating of 6.6/10 being displayed, and 234 reviews. 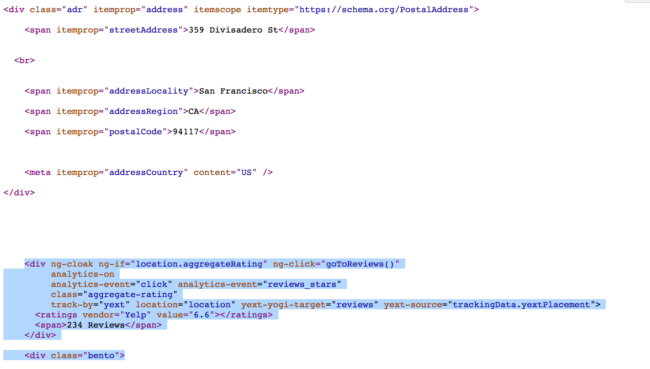 If you look at the code, Yelp is using Schema.org and using the aggregateRating amount, whereas MapQuest is not using any sort of valid markup, though they do have a DIV called “aggregate-rating” and a value of 6.6 assigned. Based off looking at the two code snippets above, I do not believe that MapQuest is doing anything wrong. They don’t have the ratings inside of valid Schema, but Google is choosing to show the stars anyway. So good for them while it lasts!